If you want to understand real estate, it’s important to see the big picture. It’s one thing to unpack trends for a neighborhood or county, but when we take a panoramic view of the region we can often get a fuller sense of how the market is really moving. Buckle up and let’s go for a quick tour of five trends to watch in Sacramento’s regional market. Remember, I do two big market posts around the second week each month, and there are two ways to read these posts. You can scan the highlighted text quickly or take a few minutes to digest what is here. The median price has been the same for three months in the Sacramento Region, which shows the market has definitely cooled off. There may be some sub-markets that are still hot and showing increases in value, but the overall trend for the region is very telling. When looking at the median price, average price per sq ft, and average sales price in multiple counties, the market as a whole has been clearly flat for the past 90 days. Quote in SacBiz: By the way, I was quoted in the Sacramento Business Journal yesterday in an article about the slow market. Check it out at Slower real estate market could just be normalizing. It’s always an honor to share my two cents. I’d love to hear your take on the market too. Housing inventory has been increasing in the Sacramento Region over the past several months, which is creating more opportunity for buyers to get into contract (and be more picky). This has also increased competition for sellers to compete for a smaller pool of buyers. Inventory is still relatively low, which means well-priced properties are generating quick and multiple offers, yet there are also ample price reductions since many properties are simply overpriced. Sellers, pay attention to this trend because you need to price your property correctly in this market or it is going to sit. The higher the price, the more inventory there is. This is a normal trend, but it’s always interesting to see, isn’t it? Moreover, when we know how much inventory there is at a certain price range, we can help coach buyers and sellers about what they might expect. Last month it took three days longer to sell a property compared with the previous month, which is one more sign the market is slowing down. Before calling in the troops and sounding the alarm, remember it’s normal for the market to cool off as summer fades away. Generally speaking, the higher the price, the longer it is taking to sell. The number of listings jumped by about 6% from last month to this month, while the number of sales rose by just over 2% (pending sales did increase though). Overall since the number of listings outpaced sales and pendings, inventory saw an increase. Sales volume is down about 11% from where it was last year for the Sacramento region. Why? In large part it’s a reaction to investors stepping away from the market one year ago. Less cash sales in the region created a gap in sales, and the market is simply trying to figure out how to normalize or adjust now that investors have taken their foot off the gas pedal. You can see in the graph above how there has been about the same number of non-cash sales in 2013 and 2014, but the number of cash sales is very noticeably down this year. Keep in mind investors didn’t gut the market in Placer County or El Dorado County like they did in Sacramento County, but what happens in surrounding areas still matters for market trends. 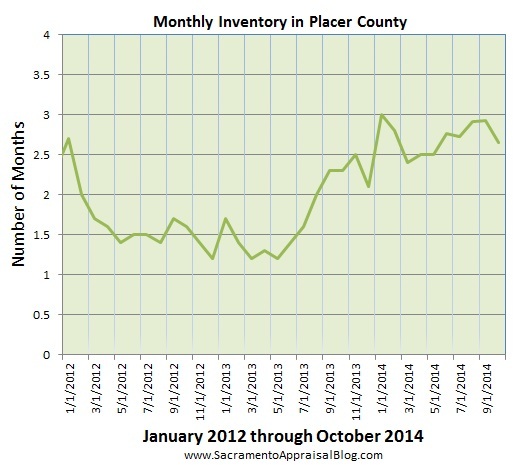 Prices have been flat in Placer County: Just like Sacramento County, Placer County is best described as flat. The median price saw a dip to $379,000 from $380,000 this month, but overall has been hovering around $380,000 for three months in a row after a small seasonal uptick this spring. It seems the peak of summer has hit, so it is likely to see the market soften up over the Fall (which is completely normal to see). Last year the market felt really sluggish though at this time in light of the looming government shutdown. This year we don’t have the same phenomenon, so the market is a bit different. Inventory saw a very minor decline last month: Monthly inventory saw a very slight decrease, but really it’s still hovering at about the same level. As you can see, inventory above $750,000 is far different from the rest of the market. Generally speaking, the higher the price, the more inventory there is. It’s taking one week longer to sell compared to last month: On average it is taking 45 days to sell a home in Placer County as opposed to 37 days in Sacramento County (and 40 days in the Sacramento Region). Generally speaking, the higher the price, the longer it is taking to sell (which is normal). There were only 14 sales between 100-200K, so take the days on market with a grain of salt. Overall it took about one week longer to sell a home last month compared to the previous month. Sales volume is approaching more normal levels: Sales volume saw an increase last month, but volume is still down by 7.5% from July 2013. Overall volume is starting to hit much more normal levels. There are more listings this month than last month: Listings increased by 5% from last month to this month. At the beginning of July there were 1387 active listings on the market, and at the beginning of August there were 1457 listings. This isn’t news to write home over, but the number of listings is something important to watch because if sales don’t increase at the same rate, the market will inevitably soften. Inventory actually went down slightly though in July in light of sales slightly outpacing listings in Placer County (very slight decline). It’s a joy to put these graphs together every month. Yes, it takes quite a bit of time, but it’s worth it. As always, I’d love to hear your take on how the market is unfolding too. Moreover, if you have ideas for how to refine or present trends, I’m always game to get some constructive feedback. Why has sales volume been down? Let me give you a hint. It’s green, sometimes crisp, has presidential branding, swooped in to boost the real estate market for two years, and there has been less of it lately. Bingo. You guessed it. The decline of cash sales so far in 2014 is one of the big factors causing sluggish sales in the Sacramento market as a whole. Take a look below. Any thoughts? Unpacking the Trends: Total sales volume is down by over 20% this year compared to last year, but let’s unpack a few numbers to really understand what is happening. When looking at all non-cash sales, volume in 2014 is only down by about 4% from where it was at the beginning of 2013. Granted, volume is down very significantly though from years prior to 2013, but let’s focus on these past two years. When looking at all cash sales, there are literally less than half as many during the beginning of 2013 compared to the beginning of 2014 (595 less cash sales to be precise). Having this many fewer cash deals effectively means the rest of the market has been adjusting to such a big change after a very aggressive season of cash buying. Escrows have seemed to take longer, there are more FHA offers, sellers are offering credits to buyers and inventory has naturally seen an uptick because of the lack of cash. In short, the market has been trying to figure out how to cope now that cash has normalized. Cash of course is not the only force driving values, but we are definitely feeling its absence this year. It’s simply a different market, don’t you think? The Wright Report: This is the most exhaustive quarterly real estate report I know of in Sacramento. The latest edition covers the last half of 2013. I contributed a couple pages to the report and talked about how there was one real estate market last year, but two chapters. You can read the report online or visit Joel Wright’s site (You can DOWNLOAD directly from Slideshare, which is what I recommend). Question: How is having less cash investors impacting the market?